Travel search site, Wego, just closed its Series C round of $17 million. The round was led by Crescent Point, a fund manager with offices in Singapore and China that focuses on investments in Asia. Wego’s site provides a metasearch across about 600 airline carriers and 400,000 hotels, and charges business clients based on referrals to travelers coming in. Earlier this year, it teamed up with home rental marketplace Travelmob to include the latter’s 400,000 Airbnb-style listings in its search too. This round of funding brings the total so far to $36 million for the eight-year-old company, said Ross Veitch, Wego’s co-founder and CEO. Wego was founded by Veitch and Craig Hewett, two Australians living in Singapore, where its headquarters are. The company also has offices in Australia, Indonesia, India and most recently in Dubai. Veitch said the company plans to use the funding to hire more people for its headquarters and to push its expansion in the Middle East. About 50 people work in Wego’s Singapore offices, and he expects to add about 20 more marketing staff and a couple of data scientists to the headcount there. Additionally, about 12 country development managers will be hired as well in Singapore; each person will be responsible for a new country, and will accompany the spin out of a new office in his territory if business there reaches a tipping point. 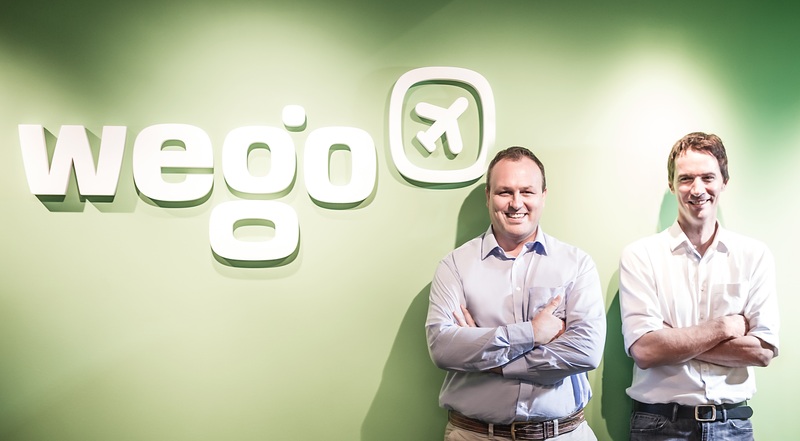 Globally, Wego has about 100 staff. The point on data scientists is indicative of Wego’s plans to make its user data more interesting for corporate clients. “We’ve been collecting data from users since day 1—every flight they’ve searched for and taken, brand preferences, favorable price points, destinations they like, business or economy flights, five or four star hotels,” said Veitch. This data mined from the audience segments can be used to augment display ads on Wego, as well as on its ad bidding exchange. Advertising contributes about a third of its revenue at the moment. The rest of it comes from referral clicks or successful transactions at the hotel or airline end, depending on the contract with Wego. Wego competes with sites like Zuji and Agoda, although Wego embeds the others’ search results in its own. The lead investor in this round, Crescent Point, has had previous investments in the travel space. According to its site, it was the second-largest shareholder in Malaysian airline, AirAsia before the company went public in 2004. Crescent Point has also invested in Chinese video-sharing site Tudou. Tiger Global and Victoria Capital are also major investors in Wego. Tiger Global has significant stakes in WordPress-maker, Automattic, and LinkedIn.